The translation world has legends of its own, but not all legends involve greatness. Many provide pain, confusion, or comedy, as these examples of bad game translation prove. This Be Bad Translation #03, SLASH HERO! This Japanese mobile game is a treasure trove of machine-translated nonsense. This Be Bad Translation #07, Battle Rangers! This arcade classic features amazing examples of bad 1980s video game translation. This Be Bad Translation #08, Tales of Berseria! This big-name, modern translation is bursting with post-game problems. 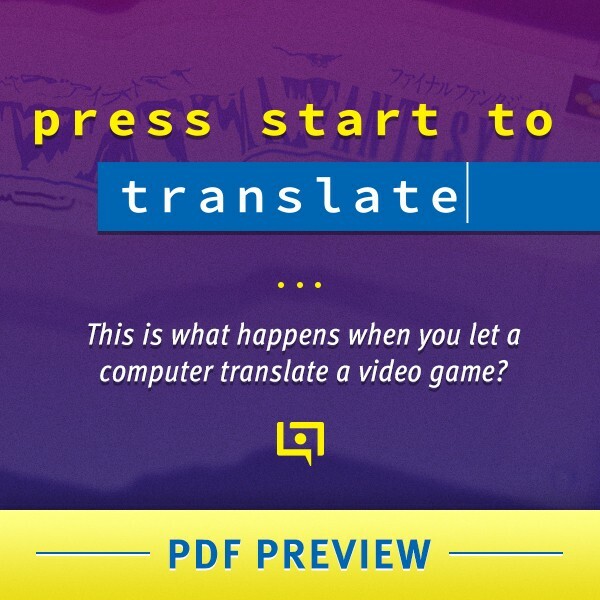 This Be Bad Translation #09, Sloppy Mobile & PC Ports! When classic games get ports or remakes, weird little mistakes sneak into their translations sometimes. This Be Bad Translation #10, Kidō Senshi Gundam Part 1: Gundam Daichi ni Tatsu! This obscure Japanese computer game is entirely in English - and it's charmingly bad. This Neo Geo classic is a great example of a lesser known, "slow burn" bad translation in action. This Be Bad Translation #13, Sword Art Online: Hollow Fragment! Why is this infamous translation considered a modern "All Your Base"? Let's find out! Another poorly-translated otome game hit Nintendo Switch's eShop. Let's look at the best of the worst lines. This is what happens when you let a computer translate a game!